What knight is complete without their trusty blade? Trick question. Because, in fact, no knight is ready without their blade. Sure knights are trained in combat with staffs, spears, bows, and knives, but when the going gets tough and there's a goblin hoard at the gate, a dragon breaking out of the dungeon, or enemy knights challenging you to a duel, you'll want that sword. Here'a nice shiny sword selection for your knighting needs. 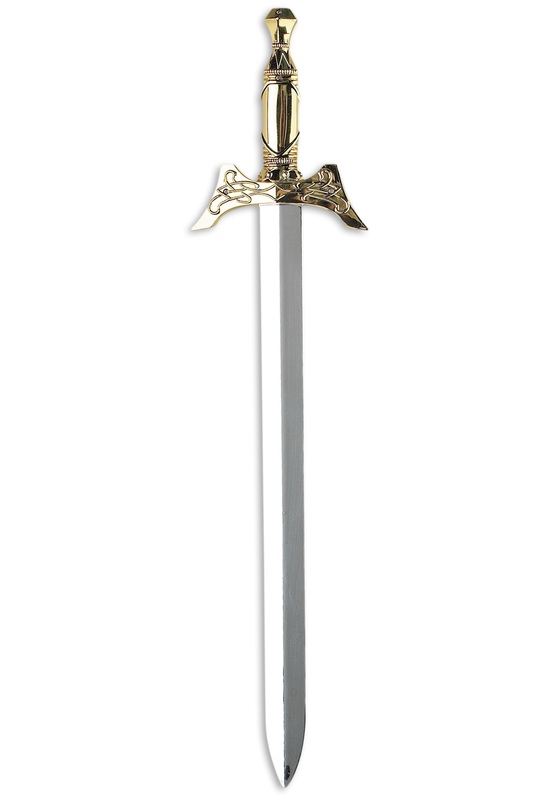 This Knight's Sword Accessory is plastic, a bright silver color, and has a gold engraved handle. It's a short blade, at about 23" long and perfect for those tight corners in the castle or some small squires who need an appropriately sized blade. So yes, by all means, get the staff and spear, just don't forget the blade. When you run into that dragon, you'll be wanting it. This sword was pretty much what I expected for the price I paid. I'm sure it will make it past Halloween so by then, it would serve its purpose. The Knight's Sword pictured had a Silver handle and looked more authentic, but the sword I received had a gold handle and looked more like a toy. Didn't match the costume well. Watch out now! The glave of through is here!